Cadel Evans became Australia's first ever Tour De France winner after executing the perfect game plan to take the yellow jersey down under. He knew that he had a massive advantage over the Schleck brothers in the time trial and if he could stay in touch over the mountains, then the Tour would be his and this is how it played out. Evans was a truly worthy winner, it was Evans that went with Contador when the defending champion attacked on the last climb in the stage to Gap and then he managed to gain time on the down hill. It was Evans that pulled back over 2 minutes on Andy Schleck on the climb up the Galibier when the Luxembourger had attacked with 60 km to go and stretched out a 4 minute lead over the favourites. Then he wiped the floor with Andy Scheck in the last time trail to take the Tour by 1 min 34 secs. There are always crashes in the Tour but what was different about this one is the amount of leading riders that found their race ended. Wiggins, Vinokourov, Zabriske, Horner and Klöden all had to withdrawal. Then there were two crashes caused by vehicles, the worst of which saw a car side swipe two cyclists, Juan-Antonio Flecha and Johnny Hoogerland into a ditch. Hoogerland landing on a barbed wire fence. It was a crash in the first few days that saw Contador lose over a minute on the main contenders as he was caught behind it. In particular the loss of Wiggins is a massive case of what might have been, he was in the form of his life, having won the Critérium du Dauphiné and finishing 3rd in Paris-Nice. Although we don't know for sure, it is fair to assume that his game plan would have been the same as Evans meaning we were possibly denied one of the best time trailing duels of modern times. The Tour is now unfinished business for Wiggins and do not be surprised if he sacrifices the 2012 Olympics to have another crack at the biggest prize in cycling. In 2004 Thomas Voeckler managed to hold off Lance Armstrong for 10 days, holding on in the Pyreness before succumbing in the Alps. Fast forward to 2011 and again Voeckler holds on to the yellow jersey in the Pyreness and only loses it on the last mountain stage of the tour. On the stage up Galibier, Voeckler showed the true spirit to drag himself up the mountain and hold the lead by just 15 seconds from Schleck. This is why people watch the Tour, to see acts of defiance and bravely that you just do not get in other sports. Mark Cavendish continued to prove he is Britain's best sportsman. Winning 5 stages, to take his total to 20, 6th of all time and he finally won the green jersey. The way that points were awarded was changed and one of the organisers admitted they did because they felt it would be a injustice if the best sprinter in the world never won it. The HTC team is brilliant and if the rumours about Cavendish going to Team Sky is true, then surely they have to also sign at least Renshaw and possibly Eisel as well. Respect & decency be damned. We brought two of the three members of the "Masters Of None" podcast onto the show, and as such, it means that we turned into self-indulgent firebrands. Normal service will be renewed on our next show, but here we talk - or should I say rant - about the things in sport that has us wanting to smash our televisions in frustration. 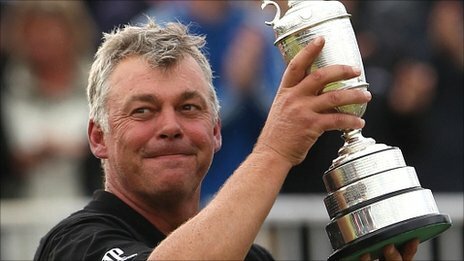 A wave of emotion swept across Royal St George's, as Darren Clarke won his first major title at the age of 42. The popular & likeable Northern Irishman shot a final round of 70 to finish The Open Championship on five under par and keep up his country's incredible recent record in majors. This episode looks at two of the most audacious bits of opportunism in recent sporting history, as Britain shock the fancied American quartet in the sprint relay at the Athens Olympics, while Reggie Miller shows just why he was called "The Knick Killer" as he single-handedly leaves Madison Square Garden dumbstruck in Game 1 of the NBA Eastern Conference Semi-Finals. Another Wimbledon fortnight has passed. The wait for a British singles champion at SW19 goes on. Not since 1977 has a British man or woman triumphed at Wimbledon, and our best current hope, Andy Murray has been unable to get past the semi-final stage. The same was true for his predecessor as Britain's No 1 tennis player, Tim Henman. There's no doubt that the broken toe suffered by David Haye during his defeat to Wladimir Klitschko over the weekend goes some towards explaining the pretty feeble display we saw from the former WBA heavyweight champion, but history won't excuse it.